Many physicians are overwhelmed by patient loads, 10 minute visits, the wealth of documentation dictated by health insurance requirements and the overwhelming overtaking of medicine by non-physician personnel. Wellness programs abound but this only addresses the symptoms of the underlying problem. We see articles and articles abounding online: physician fired or coerced into resignation for speaking about the quality of healthcare placing profits over patients or speaking about non-physicians overstepping boundaries putting patients at risk. Physicians are termed “non-team players” and “disruptors.” We see non-physicians calling themselves doctors when they are not doctors of medicine but something else other than medicine managing the most complex cases in the hospital setting at times performing duties beyond their limits. NP’s and PA’s see patients, order tests and make decisions on treatment. This is most rampantly seen on the primary care horizon under the liability and license of a physician. Some aggressive organizations of NP’s are now very powerful seeking independent practice, meaning practicing without the supervision of a physician. They have a place in medicine but their positions were never designed to overtake the skill sets of physicians. Patients are referred in-network in order to increase profitability of that company even when a better physician may be outside of the network. Appointments, which used to be at the discretion of the physician, are now reduced to staring at a computer making sure all the boxes are clicked rather than looking at the patient in the eye to construct their stories. The cancer is the business model at the center which must be ripped out. The minute medicine became profit-centered and not patient-centered was the beginning of the end of healthcare as we knew it. This is the healthcare we face today. Previously, the connection was straightforward-physician and patient. That connection is sacred which nobody on this earth held, it is that sacred. https://neurologybuzz.com/2018/06/06/returning-to-the-sacred-relationship-between-patient-and-physician/ A physician’s duty is towards the patient, taking care of them using all the knowledge of the sciences with which they trained for so long. There are 4 years of pre-medical school, 4 years of medical school, 1 year of internship, 3-5 years of residency training and 2-3 years of fellowship. That is 11-17 years of medical training. Let’s repeat, that is 11-17 years of training. Let us emphasize what goes on in that training. When you look up differences, organizations ensconce the number of years, the accreditation, will play up that non-physician personnel saves money, they fill a need, they are just as good, let’s repeat, they are just as good. However, the difference lies in the training. In medical school, there is weeding so only the most strong-willed progress to residency. Hours and hours of studying occurs before becoming an M.D. or D.O. Students learn pathology, physiology, pharmacology, anatomy, surgery. These are subjects that are wide in breadth and intense which are difficult to even cram in 4 years. Then, there is residency. There is absolutely nothing on earth comparable to the extreme depth of residency training of physicians, absolutely nothing. Internship is spent learning generalities of a wide variety of general subjects. Residents are involved in codes, rotate in the ER, rotate in internal medicine, attend daily conferences, day in day out, day in day out, day in day out. Residency entails 90-hour weeks in some specialties and those who trained before 2002. Residents take detailed histories seeing patients, formulating a diagnosis, seeing patients in the ER, the ICU, and out-patient settings. Patients are presented every single day to a senior attending who have more breadth and knowledge as residents learn from their expertise. Nights are spent at work so that the progression of disease processes and management is understood. One makes split second life-changing decisions while gradually building responsibility. The craft is finely honed daily in the 3-6 years of residency training so that physicians are completely confident to enter practice or further training in fellowship, which is another 1-3 years. This will never ever be equivalent to any other type of training on earth regardless of the profession. This is what makes a physician a physician. That knowledge and skill set is irreplaceable unless the same training is undergone. Patients can tell a difference, physicians can tell a difference. It doesn’t matter how many other years other non-physician personnel may have trained or shadowed in the hospital, it will never be anywhere equivalent to the medical studies, residency, fellowship training, board examinations and most especially the vast wealth of experience that makes a physician a physician. Patients entrust their health, their well-being and even their states of mind to their physicians. Physicians train not only for their specialties and subspecialties but they have the unique skill set to recognize subtle symptoms giving rise to other possibly devastating diseases. They are exposed to a myriad of diseases and are able to respond to chronic and to some of the most acute issues that encompass a vast fund of knowledge one can only derive from years of study and training. This can only come with the extensive training and experience which well-trained physicians have. When this perfect system and bond of a well-trained physician and a patient is broken, the system collapses. Physicians are terminated all over the country by administrators when they speak up about the diminishing quality of care when the less trained personnel deliver care or when denouncing profit over patient. Rather than addressing the problem at its roots, we place bandaids. Once upon a time, private practices flourished. Physicians followed their own patients in the hospital setting. There were no teams. The relationship was between doctor and patient. Recently, hospitalists cared for patients disrupting the continuity of care which has evolved into a team. All the patient knows is that many people in white coats were seen and the doctor’s name is not remembered. Fast forward to the future, solo private practices are as scarce as the dinosaurs that ruled the earth. Pressured by time-consuming requirements of health insurances, practices are increasingly sold to hospital corporations. Medical practices are disrupted and absorbed into larger healthcare systems. Patients are computerized files followed by everybody without a medical degree who are called doctors, practitioners and other misleading terms. This allows patients to believe they are still cared by medically qualified fully licensed physicians. Or even worse yet, we are now all called providers or healthcare providers to even the playing field of titles. Many different skill sets hide behind this title, a title coined by other sources so that everyone is deceptively equally skilled. Physicians should feel insulted when they are called provider. There are many campaigns that champion this course, advocating that it allows greater access to care and that rural places have no physicians. But the bottom line is the bottom line. It’s all about money and hiring the most economic labor for the most valuable skill set required. It has happened at the primary care level and anesthesiology level. They’ll soon be coming for the jobs of radiologists and surgeons if artificial intelligence and robotic technology do not intercede. Health insurances and drug companies are the dominant forces having an illicit affair with each other, while we are the bystanders that are profoundly affected by their decisions. Physicians contract with insurance companies and render services to patients. Coding is the norm where a multitude of questions are answered and documented so physicians are reimbursed. This is why burnout is rampant and valuable face-to-face time is replaced. This works superbly for insurance companies. Businessmen rise in ranks dictating the quality of care. Care is impeded by requirements of insurance companies. Physicians have to fight insurance companies in order to obtain an MRI of the brain for a patient they are worried might have a tumor. They undergo a process called a peer-to-peer review. A physician who is usually not a specialist employed by the insurance company reviews the clinician’s notes and determines whether the test will be covered. It might simple but not when it can take 15-20 minutes for one test. Multiply that by the number of tests that is reviewed. This is a wastage of valuable patient-physician time. This is a source of infinite frustration to physicians but insurances dictate the quality of care because they hold the purse strings for healthcare, controlling who gets the test. If it is denied then the physician and staff waste even more time appealing. If an MRI is ordered for a tumor, this may delay diagnosis and care where time is of the essence. Insurance companies obfuscate in hopes that tests or certain medications are not pursued, saving them money. Patients who need specialists have to see their primary care doctor to get a referral in order to see a specialist which can delay care. Time is exceptionally important in cases such as in patients with oncologist conditions where every crucial day that is delayed in diagnosis may result in greater shortening of life expectancy. Physicians are subconsciously dictated into referring within network because it is covered by health insurance even if a more qualified physician is a few feet away but may be out of the network. This boosts profitability within the insurance companies. Appointments are reduced to 10 minute slots. Yes, they can be extended but physicians need to pay overhead, malpractice insurance, staff wages and any school debt. It is not financially feasible to see 8 patients in one day. Patients only see that their doctors are spending more time on the computer and have less eye contact. They feel unheard and unnoticed. They do not understand the pressures physician must face or that the system has transformed the quality of medicine. Physicians are at risk of an increasing number of errors because they work at a higher and higher levels. Those who supervise non-physician personnel oversee the care of up to 60 patients a day. These are worse conditions than residency because physicians assume all liability. Where did things go very wrong? One of the pivotal moments occurred when physician assistants and nurse practitioners assumed larger responsibilities, at times well beyond their training can handle. They are paid less than physicians and have trained substantially less than physicians yet work under the same conditions, giving medical advice, and writing prescriptions. They manage the care of a patient that was once the privilege of a physician. When I previously worked in New York City, I had the pleasure of working with some wonderful Physician Assistants and Nurse Practioners under neurosurgery. They called my neurological services when needed. They took care of the neurosurgical care of patients on the floor under the supervision of the neurosurgeon. But they knew their lane and worked under such. It was a well-oiled machine where everybody stayed in their lane. The quality of care was superb. Fast forward nearly over a decade, PA’s and NP’s manage complex patients on their own with a physician type role. The job description is completely different and the training is ill-fitting to such a role. This is where the problem lies. Once upon a time, there were military corpsmen working side by side with surgeons during the Vietnam war. They checked blood pressures, started IV lines, recognized and triaged patients. They developed finely honed, valuable clinical skills. When the Vietnam war ended there were many medically skilled corpsmen whose skills would be wasted which how the position medical assistant was born. These jobs were created as a complementary position in aiding in healthcare. The positions of a PA and NP are similar, working as a complementary skill set in healthcare. They have a place in healthcare. But they were never originally intended to replace the extensive knowledge and skillset and training of a physician. To do so only invites a markedly different and not necessarily more superior quality of healthcare. There are now nurse practitioners pushing for independent practice unsupervised to dole medical advice. They are a boon for any business administrator in medicine. In the hospital setting, one doctor could be supervising 5 nurse practitioners, therefore less financial burden on the part of hospitals. Liability is less expensive for hospitals because instead of 6 doctors they can pay for one while the doctor assumes more responsibility and all liability. The minute a physician speaks up about the quality of care they are dismissed quietly and either terminated or forced to resign. Many physicians do not come forward with their observations due to fear of retaliation or retribution. Many go on quietly working in other practices with the incident never to be spoken of again. They are gaslighted thinking they somehow did wrong by whistleblowing on the corruption of medicine. Very few come forward with their stories which they hide, feeling shamed and devastated. There are now many organizations working for physician recredentialing and maintenance of certification but the bottom line is profitability. Physicians supply the goods. Physician organizations work in cahoots with these other systems. While it is supposedly prestigious to be a member of a professional organization, everything is intertwined with money being the center. MOC (maintenance of certification) is a requirement entailing large fees in the hundreds annually and in the thousands over a decade. In Neurology, recertification and MOC over is a grand total of $23,580 over 30 years including examinations or $377,727,280 for more than 16,000 neurologists. This is highway robbery and doctors in every specialty are skinned alive. A physician cannot work in a hospital unless certified. A physician cannot be reimbursed by insurances unless you are certified. What was once voluntary is now coercion in order to drain from physicians. One of the very few non-corrupted professional pro-doctor organizations is the American Association of Physicians and Surgeons who are truly physician and patient advocates. The PPP or group for Physicians for Patient Protection is a pro-patient and pro-physician group that implements proactive work. Other grassroots physician-led actions are from members of the group Physicians Working Together. Health insurances are misnomers. The health premiums run into the hundreds and thousands a month which do not kick in unless you completely paid off your deductible. A deductible is a deceptive term where one must shoulder thousands of dollars before the insurance coverage is activated. This is an incredibly profitable business for insurance companies because there is no return in investment until one is short several thousands of dollars. Healthcare is a universally needed commodity. Supply and demand dictates that the higher the necessity the more someone is willing to pay for that need, it’s sheer unadulterated business genius. Insurance companies work in close collaboration with pharmacies, drug companies which is why only certain drugs are approved. It steers that patient towards obtaining the drug with which the insurance company works with. There are other nuances about new medications, pharmaceutical drug company driven research data, connection of pharmacies, drugs and health insurances but that’s a whole different article that can be expounded at length. It is 2018, medicine is now an extremely corrupted business of profit over patient. However, one physician did decide to take a stand for patient care. http://padailypost.com/2018/03/20/medical-group-goes-doctor-1-4-million-legal-fees/ Diana Blum is a neurologist who worked in a medical practice in Palo Alto in 2009. When she became a shareholder and attended business meetings, she became more cognizant of the business dealings of the group. Some examples were reported to include not referring out of network, not using drug samples and other practices that increases profitability from a business aspect. When she commented on the negative impact on patient care she was labelled a “non-team-player,” “disruptor” and using “inappropriate comments.” She was reported as offered 3 options (1) resign to avoid negative letters of recommendation, (2) be terminated or (3) bring a claim or expose to the media knowing she might never work in that area again. She was reported as placed under PIP or performance improvement plan despite having some of the highest ratings in satisfaction by patients. She opted to resign under coercion. At one point, she consulted on one patient with reported negative impact from these types of practices and decided to take a stand. Many of the relevant facts were suppressed because the judge reportedly thought it might bias the jury. The judge was reported as siding with the other side as to who owes legal fees. There are still many details that Dr. Blum is not at the liberty of declaring since an appeal is ongoing. She reports there are many physicians in the same company with similar observations and pressures but cannot speak due to fear of retaliation and repercussions. This information was shared with her permission. This marks the crossroads of medicine. After all the extensive documentation for electronic medical records, the shortening of the face-to-face time physicians have with their patients, the quiet rampant replacement of physicians with nurse practitioners and physician assistants where in some states they are allowed to work independently, this is one incident that must not be a small blip on the news, that must not be allowed to fade. It signifies a very important turning point in the standard of care. It can easily be sensationalized or demonized but this sets the precedence of things to come. It signifies that a physician who advocates for patient care invites termination. If one brings claims against administration, the corporate office has an unending supply of legal arsenal to retaliate against that physician. This has to be one of the lowest points in medicine. This incident is of utmost importance because it sends a chilling message that essentially signals the suppression of physician voices all over the country. If physicians do not take a stand on behalf of patient care, who will? Physicians must be both physician and patient advocates. Nobody cares about physician burnout except physicians. It is of no consequence to anybody else if patients see less of their doctors except to physicians and patients. Both physicians and patients have been on the losing team these past few decades. We need to take back medicine or the only ones who will lose are the very ones it is supposed to serve. How can we change the system? Both physicians and patients need to be their own advocates. Patients must demand to see a physician, not non-medical doctor personnel and have a right to see their physician with whom they have the patient-doctor relationship. Other options are to look into direct primary care and take on catastrophic insurance. This bypasses the monthly costly fees to insurance companies. Physicians involved in direct primary care tend to have access to the lowest rates of medications and can direct patients to less costly outlets. Physicians in private practice and direct primary care have access and knowledge of companies with imaging studies with the most economic rates. Instead of a $3000 MRI deducted from the high deductibles paid out-of-pocket, a wholesale type price straight from the company can be $300. Patients need to be their own advocates by taking care of their health. Everything is interconnected, including the fast food industry, the companies that manufacture processed food, the drug companies, the insurance companies, and the health industry. Everything is big business. When people are chronically ill related to a lifestyle of unhealthy food they need medicine, they need healthcare. It’s an unending profit cycle. Each business feeds into each business. It’s a merry-go-round of profits. Healthy people do not need to see physicians. Prevention is key to keeping the doctor away. Fewer patients mean less shortage which means better quality care from physicians. Physicians do not need to hang their heads low accepting the workload they are given. There are other options including direct primary care, entering private practice, and deleting insurance companies. Speaking up and raising awareness of these issues should not be discounted. Many physicians are resigned to the fate of medicine but it does not have to be that way. There are physician activists who are well adept and fighting the worthy cause through legislation, including Dr. Westby Fisher who is working to fight MOC. This includes a recent success story of Dr. Craig Wax winning the battle along with 3 other doctors untying professional membership from board certification. There are physician advocates raising awareness of the exorbitant pricing of medications and kickbacks such as that seen in the work of Dr. Marion Mass. Officials have taken note. Physician writers who are well-connected can raise awareness of these current conditions. If you see something say something. Physicians should demand they be called Doctor and Physician not provider, not health care professional, not health care provider. It is an insult to your nearly 11-17 years of training to be called anything other than that. We are physicians who studied to take care of patients to the best of our ability. It is because of our very complacency and the burgeoning work requirements which have caused these current issues. Nobody else will extricate physicians and patients from these predicaments except ourselves. One day everybody will be a patient, if healthcare is worrisome now, its deterioration will only continue to worsen. The next generation will not even understand what excellent healthcare is because they would have never experienced it which is very sad. It is easy to be complacent but one day every single one of us will be affected whether at work or at the doctor’s office. When someone’s mother with a devastating disease is cared for by a physician assistant who knows nothing about that patient and has to step outside 4 times to check on records and cannot answer the most important questions, one knows it is time to make a change for the better. It is troubling to say the least when you see a medical office plaque for subspecialty with 16 doctors in white coats caring for the sickest group, when on closer inspection 8 of them are nurse practitioners and physician assistants. In a few years time, there will be fewer with M.D.’s and D.O.’s after their names. One day there will be one licensed physician handling a whole department on non-physician staff. As I leave my business cards with doctors offices, I am shocked to discover that some practices have non-physicians who are 1/2 the staff on their shingle, especially hospital practices. One day it will be one doctor and the rest non-physicians. Is this really the way we want medicine to become? Physicians are leaving medicine by the droves and are fed up with the state. Others feel powerless and feel that this is their only recourse bogged down by huge loans and personal responsibilities. Medicine has essentially become a business, an industry, profiting from physicians and patients, employing the least trained personnel to replace and step into their shoes and depriving patients of quality time and care they deserve. In a few years, medicine will become a shell of what it used to be, it will only deteriorate further if nothing is done now. In watching idly continuing about with our business, we are complicit with its decline. If a physician such as Dr. Blum cannot even fight the good fight for patient care and cannot reason that the ongoing healthcare policies are detrimental only to be suppressed and devastated for speaking up, then the rest of us are doomed. One of the basic tenets of serving as a physician is “primum non nocere,” first, do no harm. To stay silent on these issues grossly impacts patients in a negative manner. But how do we advocate for patients when we are silenced and censored? Dr. Blum is devastated and suppressed for advocating for good patient care. She is the sacrificial lamb in standing up for care. It strikes a chord in many physicians because this is why we chose this profession and trained hard for it. We cannot let medicine be ruined. We rise above it. If we can soldier through 90-hour work weeks during intense training which no sane person would want to experience, why should we let non-physician administrators dictate how we practice or decide that we make inappropriate comments. It is every bit of convolution. If a stand is not taken now when will this descent end? Medicine is in shambles today because we are complicit and enabled this to happen, perhaps not by choice but by inaction. All the wellness programs in the world will not reverse the underlying cause of the dilemma. The quandary is that healthcare is reduced to a masterful game of production and profit, the pawns are patients and physicians. We must actively take ownership of our responsibility to our patients, pick up the shards and rebuild the patient-centered system it is supposed to be. We can do this, every single one of us by not tolerating these conditions by saying no to the current state of affairs. Some details have been outlined. By not enabling the way medicine is practiced we can make a change. By giving our patients the best of ourselves and not just snippets of time resulting in a gross overload of work we are not doing a justice towards our responsibility towards our patients or ourselves. Discussing it does not work. But if every single one of us changes our work habits maybe even our work by doing DPC or something similar we take back medicine so we practice how it is supposed to be and not under the restrictive conditions of a profit-driven insurance company. When you’ve practiced under both conditions you see a huge difference. The horse is already out of the barn. But who else will care enough to fix this mess and make changes, nobody else but us. Primum non nocere, first, do no harm. This is our calling, this is our truth. If you’re burned out reading this article check out the medicine Musical of colleague Writer, Lyricist, Composer – Michael Ehrenreich, M.D. Just helping a colleague promote their dream. Seeing physician burnout articles every page you swipe on social media, on physician online media groups, and in editorials of national syndicates are becoming the norm. Not to minimize it, it can become fairly discouraging reading about the fate of well-educated healers with only the noblest intentions becoming victims of the healthcare climate that is medicine today. Reading about these issues, one can become disengaged when you are in the throes of working. It is when one becomes completely removed from the situation when you realize the extent of the dysfunctional system. Yes, the system is terrible, yes, there are too many regulations, too many middlemen, too many people getting in the way of the genuine whole-hearted connection between patient and physician. Where does that leave us and how can we rectify the situation? It used to be that the relationship was between patient and physician. Patient and physician. There was no such thing as health insurances, no such thing as MOC, no such thing as EMR, no such thing as healthcare professionals. It was patient and physician. Physician and patient. Doctor and patient. Patient and doctor. There was nothing to separate the physician from caring for his patients. 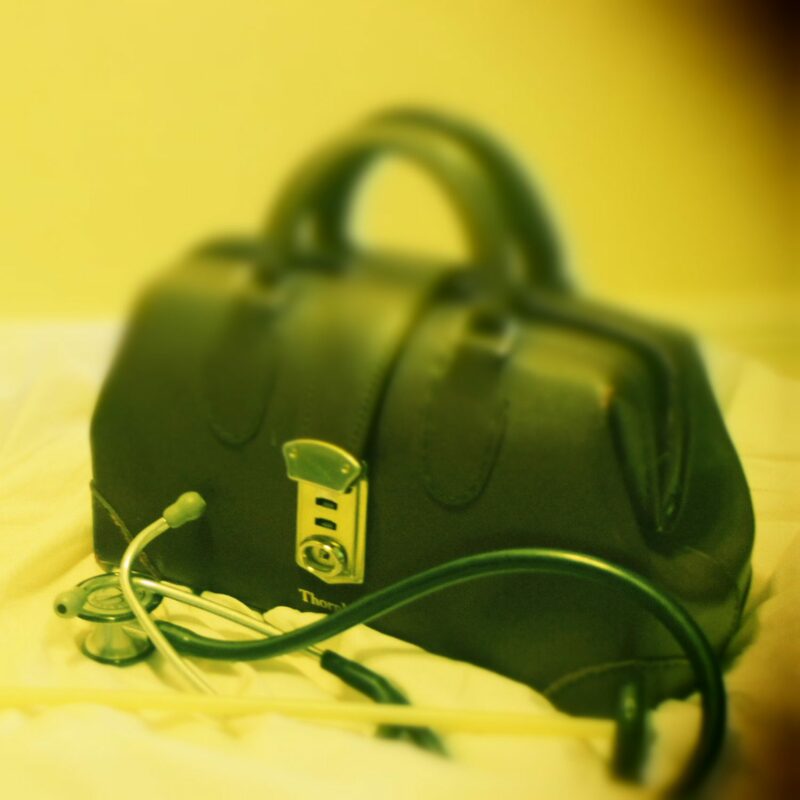 Doctors used to travel with their doctor’s bags to their patient’s home, making house calls, being paid with services or what little the family had on their farms. Doctors took out their trusty stethoscopes and gave a healing balm, sometimes they helped their patients sometimes not, since the remedy was beyond the technology at the time. There was no such thing as malpractice insurance. No such thing as deductibles, no such thing as premiums, no such thing as clicking little boxes that sums up a human’s suffering. The relationship between a doctor and his patient was at its best and humblest-to care for the sick. Not to cure, not to treat but to comfort always. Absolutely nothing stood in the way between doctor and patient. That relationship was pure and untouched. How does one go back to this very sacred traditional relationship? If doctors do not realize this is a crisis situation where this very symbolic connection is being threatened by a huge number of many outside forces, they must be hiding under a rock. When one sees hundreds of articles on physician burnout, how to end the patient interview, courses on coding to get the most out of a visit, you know there is something utterly amiss with the system. There will be the business end of the situation, you do have to pay for staff salaries, paper supplies etc, after all. But the physician-patient relationship is one of the most paramount human connections that cannot and should not be replaced. To heal and to comfort someone during their last few days, to determine if someone no longer has meaningful recovery after suffering from a massive myocardial infarct, to tell a patient they have a glioblastoma multiforme and there is very little chance of recovery, these are sensitive dealings that should not lay on an artificial robot, a medical substitute or a paramedical person. Important discussions like these should be with the physician. In order to have these important discussions, one must first have a relationship. One must never forget why we have entered medicine, to serve our patients. The human connection between a patient and physician is one of trust and hope. But how do we get back there when there are so many compelling factors threatening its very existence? A basic tenet of remedying a situation is to acknowledge that there is a problem. When one realizes the way one operates is not sustainable, your psyche will address the situation and make changes. If one stays in the limbo, the system can consume you and spit you out. Such are the sad cases of colleagues ruthlessly cut to be replaced with cheap labor by the upper business echelons. Difficulties coping with this new unsatisfying overburdensome system leads to disillusioned physicians, who previously took pride in their work now reduced to electric circuits, cogs in a machine. And because physicians are perfectionists we feel like failures if we cannot cope. This leads to the worst case scenario which is to take your own life. We should find pride and satisfaction in what we do. Instead, there are now wellness programs which are a slap in the face placing the blame entirely on the physicians’ shoulders because we are unable to cope. Patients cannot fathom the extent of this medical crisis. All they know is that their physicians keep getting changed because of rapid turnover or a whole encounter is all of 10 minutes to summarize 10 complex problems. The answer lies within ourselves. Nobody can turnaround the situation except ourselves. If we want change we change our whole outlook, whole way of thinking and whole way of practice, it begins within ourselves. I used to have a wonderful medical assistant, she did all the pre-questionnaires for me and dutifully entered it into the computer database. As the patient entered my office, I am guilty of saying,”hold on, let me read what my assistant typed” while the patient is seated, gob-smacked, looking at me silently. Looking back I can only shake my head and wonder,”wow, what was I thinking I sound like a cold robot,” which I was. All the boxes were checked perfectly, I did my neurological exam, whipped out my pad, scribbling 5 medications for 5 different symptoms, filled out MRI forms, went over the plan speaking as quickly as possible. Off my patient went on his merry old way, disillusioned and somehow left unfulfilled. Imagine this occurring 20 times a day. I was fried by the end of the day, my patients left dissatisfied and staff went through the office like hotel guests through revolving doors because of the tediousness that is medicine today. When I used to work in hospitals, residents did the pre-work-up as was part of their training, relationships were fleeting, care was in teams and rotations. Now, I see new patients for 1 hour, they are now eloquent, unique stories again, not templates that you copy and paste and change with a few details according to the patient. I let them expound until they have nothing left to say. I ask my part, perform my examination which is where the healing touch occurs that every patient subconsciously craves and we go over the plan. I answer all questions until there are no more. It is not uncommon for a patient to shake my hand heartfelt looking me in the eye thanking me. Other times, I receive a warm hug. It is not just as a courtesy gesture but a real expression of appreciation. While I did not cure them I provided so much more, the therapeutic healing relationship that exists between a patient and a doctor that no matter what happens I am now there for them. My heart warms and I modestly reply I didn’t do anything. But deep down I can feel the palpable difference. I have returned to the roots of medicine. I finally understand that this is what it is all about. I now listen to them. I listen to their own unique stories. I make eye contact and take in everything they have to say, the furrowing of their brows, the tone of their voices and I hear what they are saying. I now get comments how they are happy they found me their last doctor only took 5 minutes, while I muse to myself, I used to be that doctor. I remain neutral and non-judgmental, but I am now aware there is a simply better way of practicing now. Going back to the basics of communication, human connection, one remembers the reason why you entered medicine. We are slowly replaced by parallel industries where practitioners of dubious training are hailed new miracle healers. Everybody is calling themselves doctors. They spend more time listening and are less regulated. We have lost the art of listening. It has gotten lost in the world of electronic recording, the need to generate copious amounts of data on one patient encounter, in the new team service approach. The unique relationship between doctor and patient is subsequently insidiously altered-soon to be extinct as doctors are slowly being replaced and encroached by other forces. But the solution is very simple, we must return to the country doctor model. Within the very listening provides great comfort. When comfort is achieved we have done our job. We may not cure or treat, but we always comfort. The paradigm shifts back to doctor and patient. I cannot emphasize it enough, cut out the middleman. Anything that keeps you apart from your patient widens the chasm and becomes a barrier, an impediment. Assistants, insurances, computers, physician extenders, these were never around before. When you strip it back down to the bare bones, you return to the rawest, purest form of medicine-the relationship between doctor and patient. Patient and doctor. We should go back to the country doctor model. It is only then you will realize the depth that is medicine. Only then can we practice medicine the way it is supposed to be…between physician and patient. Patient and physician.